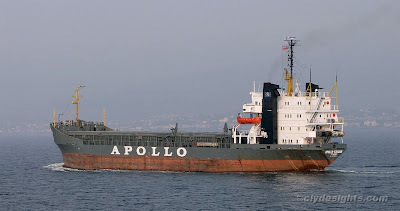 Heading back to the German port of Brunsbuttel for another cargo of cement, APOLLO FALCON was seen as she passed Cloch Point in the early Saturday morning sunshine. As she is a foreign vessel visiting UK waters, she is exhibiting a courtesy flag. In her case it is the Union Flag, which can be seen flying from her mainmast port yardarm. Strictly speaking, she should be flying a Red Ensign from the starboard yardarm of her foremast.